Valencia started the day ninth in the table but slip to 11th on a night to forget for Gary Neville. So, Diego Simeone's men have won five out of six in the league since losing to Barcelona on 30 January. Barca - eight points ahead with 10 games left - remain firm favourites to secure another title. 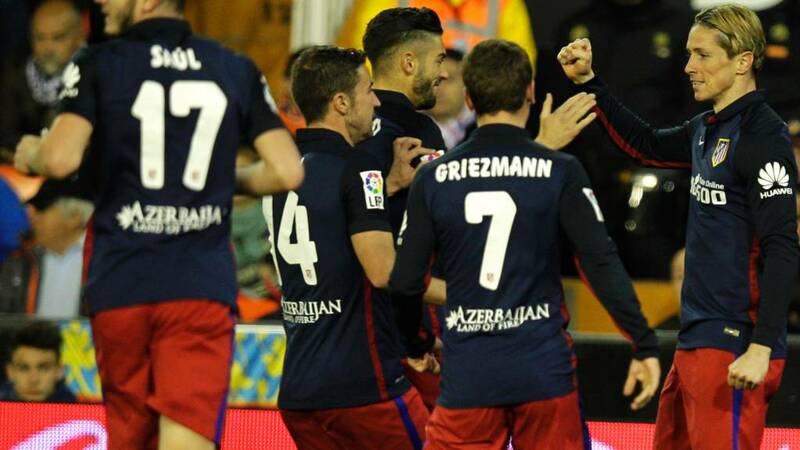 But Atletico's performance suggests they are not going to roll over for the Catalans. Jeers greet the final whistle. The natives are restless again. For Valencia it's six defeats in 14 La Liga games under Gary Neville. For Atletico Madrid their fight for the title goes on. Valencia's three La Liga wins under Gary Neville have all come against teams in the bottom half of the table. They will be desperately disappointed not to get something from this but individual errors have proved costly. Three minutes of additional time. Valencia don't have much time to recover from this - they are in Europa League action against La Liga rivals Athletic Bilbao on Thursday. Atletico's third goal sparks a rush for the exits. Valencia's fans have seen enough. This has been a night to forget for Gary Neville. His side have shot themselves in the foot - big time. Oh dear. More comical goalkeeping from Diego Alves puts the game out of Valencia's reach. The Brazil keeper looks embarrassed as Yannick Carrasco shoots straight at him - and allows it to go between his legs into the net. Terrible. So close to a third goal for Atletico as Yannick Carrasco fires just wide. Atletico have the momentum. As it stands Atletico have cut Barcelona's lead at the top to eight points. There are 10 games remaining after this. The door is still open for Atletico. Just. What a story. Fernando Torres, who has only just come on, revives Atletico's title hopes after stabbing home inside the six yard area when Valencia failed to deal with a corner. Diego Simeone does a jig on the sidelines. Those black and white plastic flags are being waved with great enthusiasm. The mood in the Mestalla has changed after the recent wins. You wouldn't bet against them from nicking this. It's on a knife edge. Atletico have around 25 minutes to find a goal otherwise the race for the La Liga title race is as good as over. Step forward Fernando Torres. The former Liverpool striker is on the pitch after replacing Matias Kranevitter. I've just seen another replay of Alves' save - it gets better and better. A real moment of quality by the Valencia stopper who somehow manages to push the ball onto his bar. That could be a big moment in this title race. Outstanding save by Diego Alves who makes up for his earlier error with a brilliant one-handed diving stop to keep out Luciano Vietto's powerful close range volley. Atletico can't believe they are not ahead. First yellow card of the game goes to Valencia's Aderlan Santos for a sliding tackle from behind. New shirt for Luciano Vietto. The Atletico forward almost has it ripped from him by Guilherme Siqueira's ridiculously high challenge which goes unpunished. Vietto walks away with a huge rip in the back of his top. Gabi's radar is all wrong as the Atletico captain lets fly from about 20 yards. This half hasn't got going yet.